In 1961, the first mission of RAGENE, a small radio-tracer laboratory of the then Atomic Energy Commission in Dhaka started, in which the “Atomic Agricultural Institute (INA)” of the Bangladesh Atomic Energy Commission of Dhaka was developed in a more organized management center in July 1972. It was transferred to Bangladesh Agricultural University campus in Mymensingh in 1975. In 1982, “the status of an independent agricultural research institute” was obtained and it was entrusted under the administrative control of the Ministry of Agriculture. It was declared as a national institution by the Ordinance No. 2 of 1984 and it was renamed as the Bangladesh Atomic Research Institute (BIN). Without the Ordinance, Act, Act No.-4, in 1996, was amended by the Bangladesh Parliament and became the law. Location of Bangladesh Atomic Research Institute (BIN) head office in Bangladesh Agricultural University (BHU) campus in Mymensingh. It is located 5 km south of Mymensingh railway station and about 125 km north of Dhaka. Its infrastructures and accessibility facilities have been developed across the 33 acres of Bacabi campus. In addition to the office campus, there is another residential campus at 8.3 acres of standard space in the city of Mymensingh. 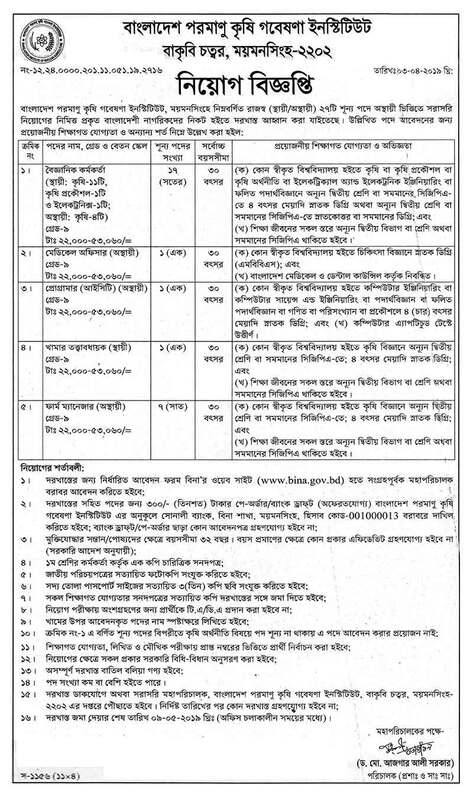 Job Description: Bangladesh Atomic Research Institute is a very fascinating job circular in Bangladesh.